So after a few months of brainstorming, this is what we came up with. There were things that I absolutely wanted to have for this project. A cooler was necessary for the cold beer, and it needed to be easy to transport. 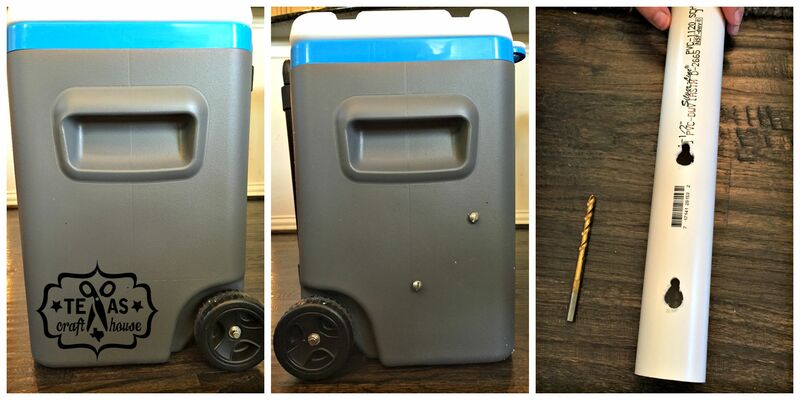 So I chose a cooler with wheels and a handle. If you are going to make one, consider the size of the person. My Aunt is petite, so I didn’t want a giant cooler she would struggle with moving. 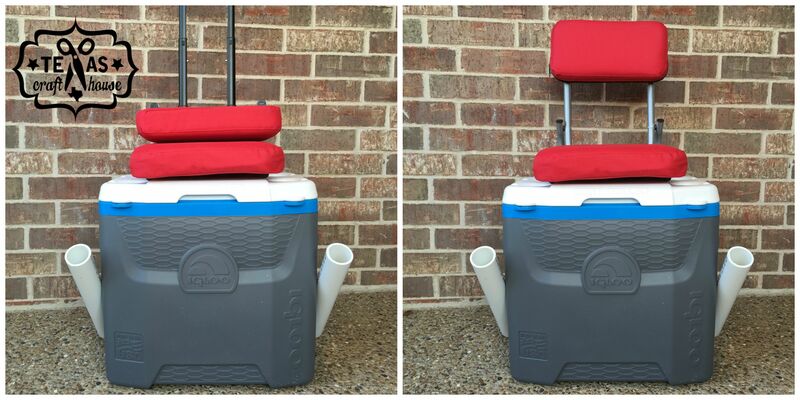 A bigger person may need a bigger cooler to sit comfortably. Next, I wanted to make sure it could hold her fishing poles. I wanted a set up that could hold the poles while she moved the cooler around and could hold the pole while the line was in the water. Two other things this cooler needed was a place for her to sit, and a personalized touch! (I also wanted to incorporate a cup holder, but never came up with a successful plan for that). We started with the fishing pole holders. For these we simply used PVC pipe. I bought one piece of pvc pipe approx three feet long and cut it in half. Then we made key hole cuts in the pipe. We inserted screws into the sides of the cooler, secured them with nuts, so then the pvc pipe could just slide on the screws. Remember to measure twice and cut once! For the seat of the cooler, I picked up a stadium seat from Academy. It was very reasonable priced (less than $15). It took us a while to figure out how to attach the chair, because we needed to make sure the handle of the cooler could still lift up when the seat was down. At some point, we realized the chair had zipped pouches for the cushions to be removed, so we unzipped them to find and easy way to attach the seat to the cooler. We took the board out of the bottom piece, which held onto the backrest part of the seat. We set this piece of wood on top of the cooler, and marked where the existing holes lined up. Then we drilled four holes. We put the board back into the seat, but left the cushion out. 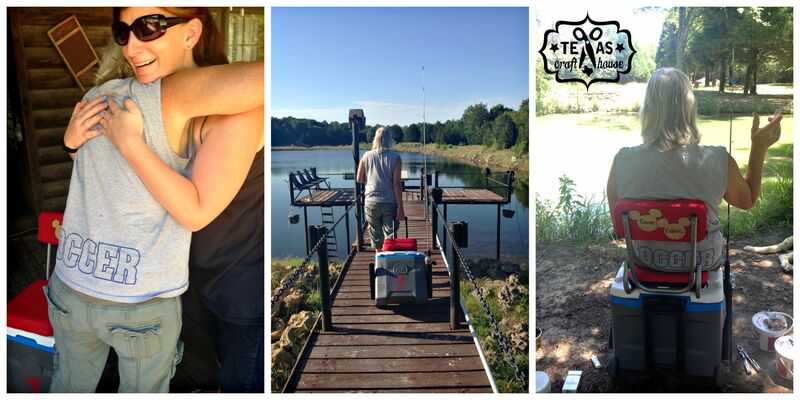 Using three inch bolts we ran them through the wood, through the silver poles, and finally through the cooler. We secured the seat with nuts and then added caulk for added stability on the underside of the cooler lid. We were worried about the integrity of the cooler since we drilled into the sides so we used Rain or Shine PVC glue, to keep the cooler from leaking. Make sure to do this outside, that glue has a very strong odor! I then used tempra paint to paint the pvc black. Now comes the personalization part! On the front of the cooler I wanted a picture of Mickey Mouse fishing, and my aunt’s name. Elisabeth and I looked online, but all the images were too busy. Finally, I just drew a picture of Mickey fishing, and made my best attempt at copying the Disney font. 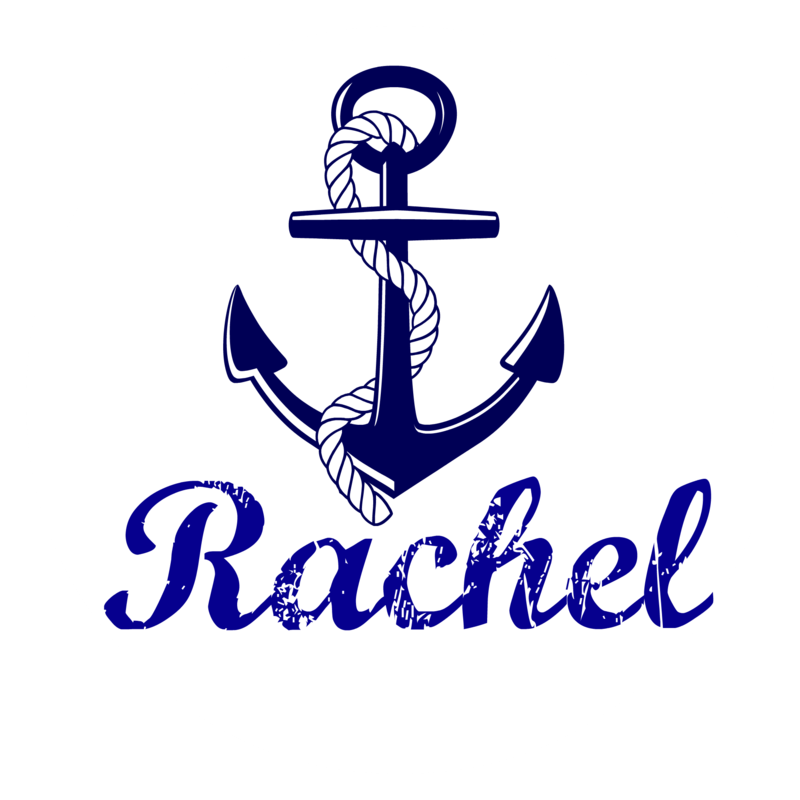 Elisabeth worked her Cricut Magic, put the image in her computer, and whipped up a vinyl sticker! This easily transferred to the front of the cooler. 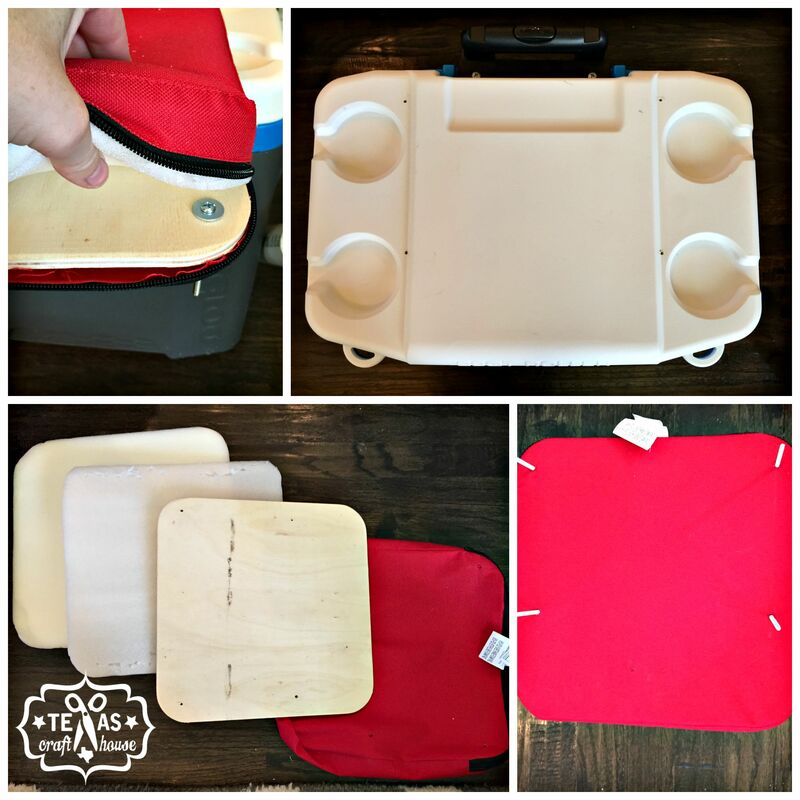 We chose the red colored vinyl to match the seat of the cooler. The seat had “Academy” embroidered on it, we tried using a seam ripper to pull the logo off, but it just didn’t look good. I found some burlap Mickey stickers at JoAnns, so I used them to hide where the logo was. I used fabric paint to write “gone fishin”, and used liquid stitch to secure them to the seat. When I gave it to my Aunt, she went nuts! She absolutely Loved it, and we immediately took it fishing! She loaded it up and had a smile on her face the whole time we were out fishing. You can see from her Facebook posts that she enjoyed it! This is so cool n so thoughtful ! Genious! Wow so inventive and useable! Nicely done! I may have to tweak something this for going to the beach! Tracy G.
What a marvelous idea! Very creative and so special and personalized. Wow, that is such a cool idea. love it! This is a fabulously thoughtful and perfect gift. So clever.